A perfect dish for Easter dinner or a terrific way to use up the leftover ham! 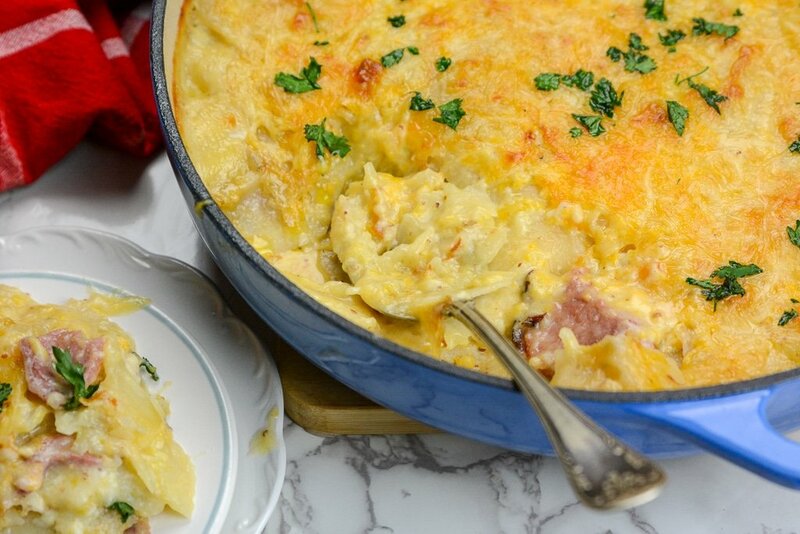 These Easy Homemade Au Gratin Scalloped Potatoes and Ham are a winning main dish or side. Tender potatoes, juicy ham, compiled together in a creamy and cheesy sauce and baked to perfection. 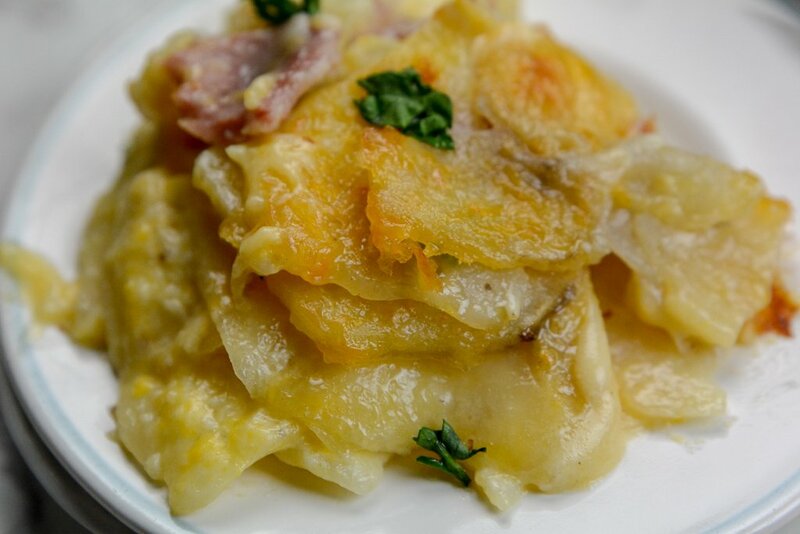 Easy Homemade Au Gratin Scalloped Potatoes and Ham is a true comfort dish, and this recipe is going to shine brightly at your dinner table. I have served it as a main dish with a veggie as the side. Then other times I serve it up as a side dish when we have a family gathering. I have gotten back into loving my cast iron skillet. I recently purchased a new one and it was beyond worth it! 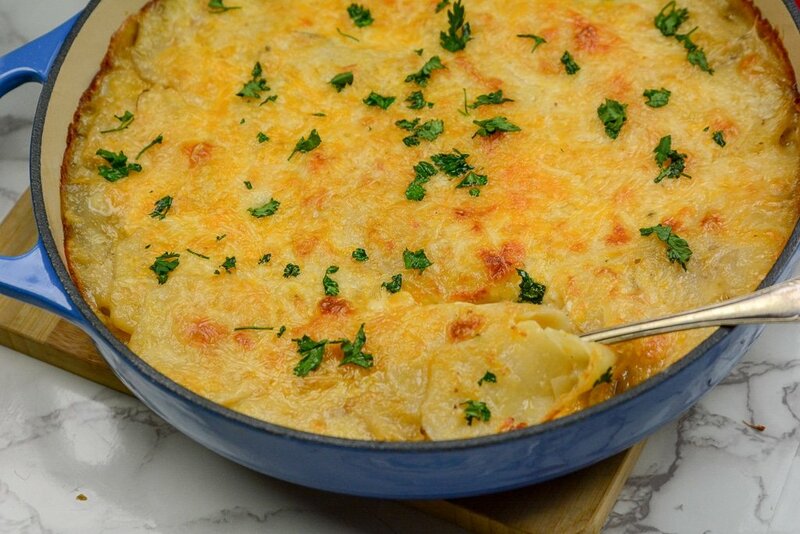 If you love scalloped potatoes than this is a must make recipe. If you don’t have ham you can omit it from the recipe! 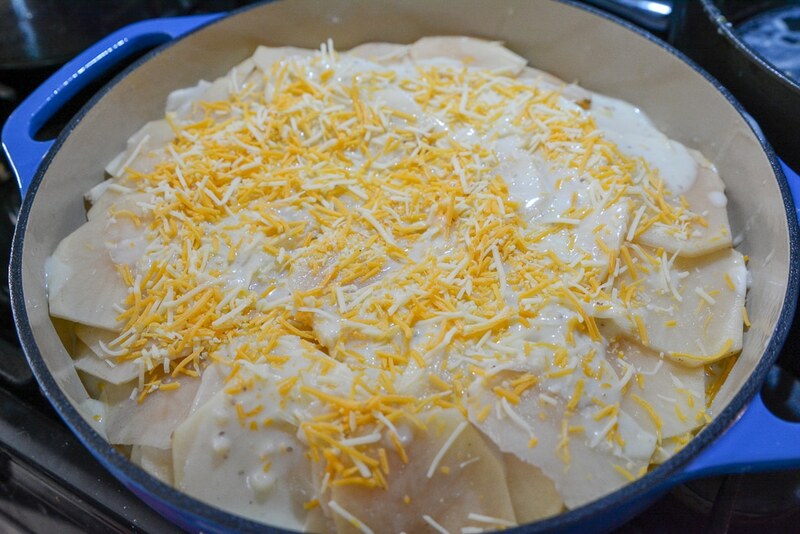 The scalloped potatoes by themselves are tasty enough. Or if you want it to be the main dish you can even swap the ham for shredded chicken, diced Canadian bacon, or even a pulled pork tenderloin. What’s the difference between scalloped potatoes and au gratin? 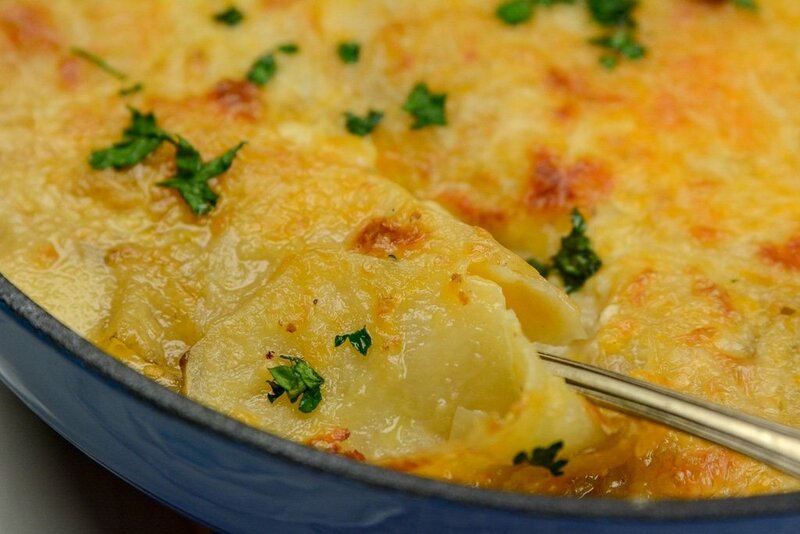 There is a difference between au gratin scalloped potatoes and scalloped potatoes. You will find that au gratin is more of a layered dish of ingredients with a cheese topping. 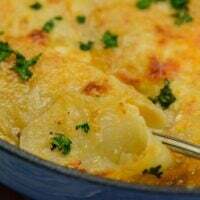 Whereas scalloped potatoes offer a creamy and thick sauce that is combined and baked. 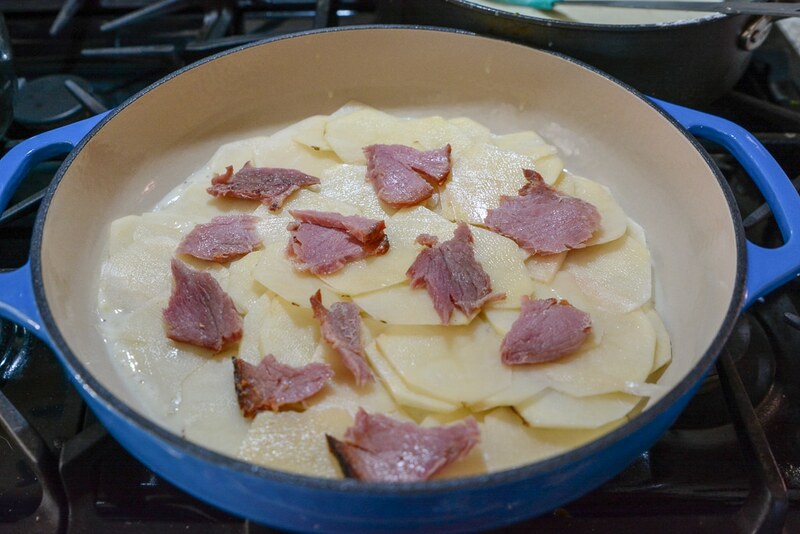 You can make your scalloped potatoes and ham around 6 hours in advance. If you go any further you will find that the potatoes will begin to break down a bit and can become a bit mushy in texture. I personally reach for a Yukon Gold or even a russet potato. You will find the russet potato offers a higher starch which results in a creamier sauce. But, the Yukon will hold up better through the cooking process. 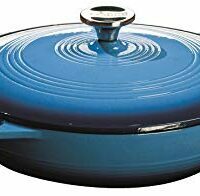 If you love Cast Iron Recipes you will Also love Grandma’s Old Fashioned Beef Stew made in a dutch oven. Also, a great way to use up your Instant Pot Honey Ham leftovers. Invest in a medallion for getting those consistent potato slices for your scalloped potatoes. Or if you have good knife skills go for it! I find that having a consistent size of potato in your scalloped potatoes will give you the best texture. If some potatoes are a lot larger they might be less done, while thinner potatoes could be overcooked and begin to break down easier. Aim for around 1/8 inch thick. That is a standard measurement you want for homemade au gratin scalloped potatoes. Now if you want you don’t have to peel your potatoes, that is an optional option. A lot of times I prefer a peeled potato. These scalloped potatoes and ham are a winning main dish or side. 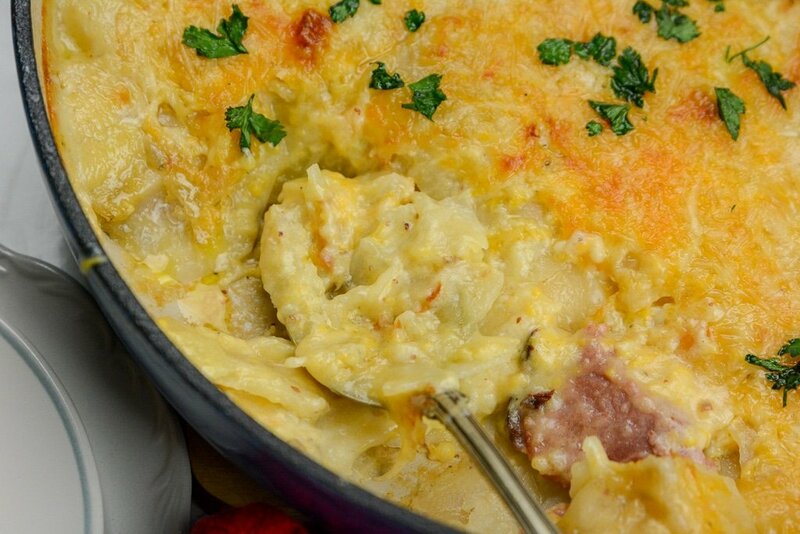 Tender potatoes, juicy ham, compiled together in a creamy and cheesy sauce and baked to perfection. Add chicken broth, and Milk continue cooking until mix becomes bubbly and thick. Peal and slice your potatoes so they are very thin. Layer of potatoes on top of the milk mixture. Coat with a layer of Ham and cheese on top. Another coat of milk mixture. 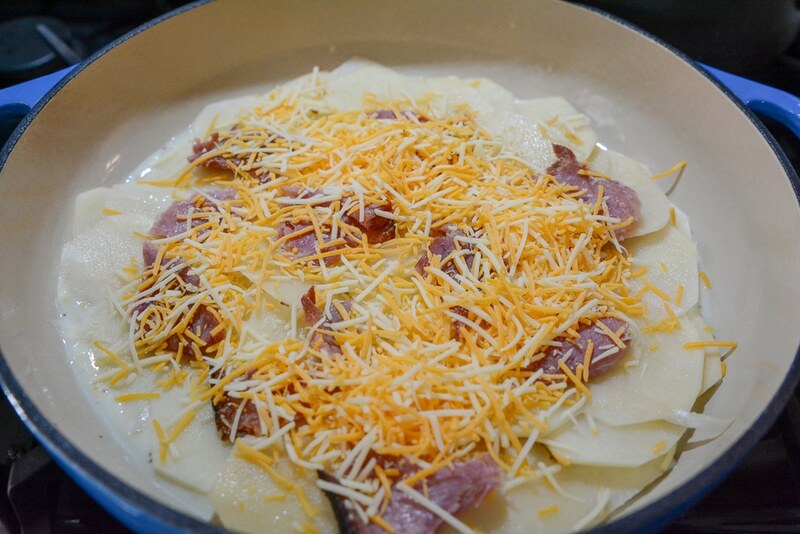 Continue layering with milk mixture, potatoes, ham, and cheese till your pan is full. Your last layer should just be Potatoes, Milk mixture and top with cheese. Remove cover and continue baking for 15-30 minutes or until top is golden brown.